Tooele’s Griffen Bate drives the ball into the outfield during the Buffaloes’ 10-2 win over Ogden on Tuesday at Dow James Memorial Park. 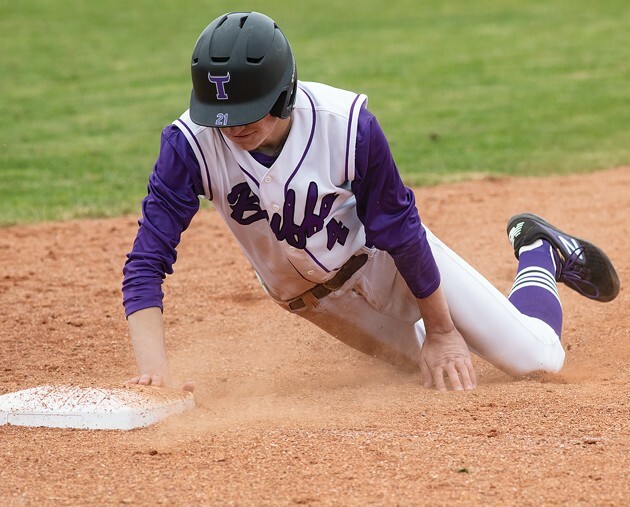 Tooele’s Clay Freeman slides back into first base during Tuesday’s game. 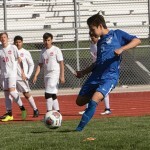 The Buffaloes have won seven games in a row and are tied with Juan Diego for first place in Region 11. Tooele’s Clay Freeman (4), Griffen Bate and Brett Porthan (10) celebrate during Tuesday’s 10-2 win over Ogden at Dow James Memorial Park. Porthan pitched a complete game for the Buffaloes. 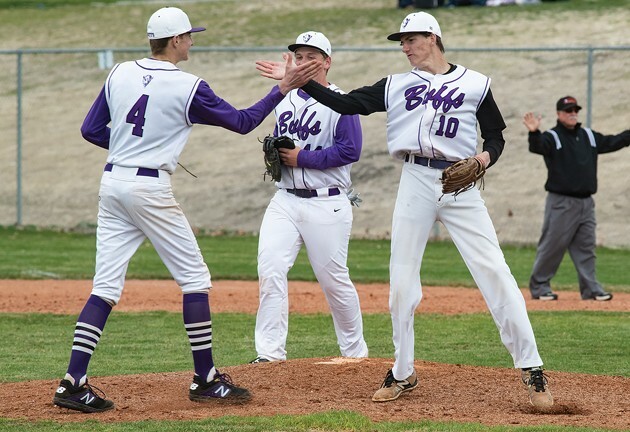 The Tooele baseball team came into the 2019 season looking to prove it belongs in the conversation as a threat to compete for a Region 11 championship as coach Nolan Stouder entered his third year in the Buffaloes’ dugout. Tuesday’s 10-2 win over Ogden at Dow James Memorial Park was a chance for the Buffs to show why they believe they can make a deep run this year, with dominant pitching, solid defense and an explosive offense that has led them to seven consecutive wins to open Region 11 play. Tooele (7-4, 7-0 Region 11) started a bit slowly, spotting Ogden (0-9, 0-6) an early 2-0 lead and not recording a hit until the third inning. 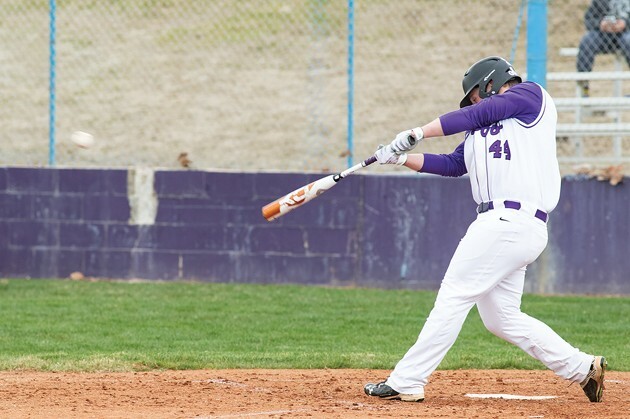 The Buffs started to show signs of life in the third inning, loading the bases with two outs after Nick Hogan singled, Clay Freeman hit into a fielder’s choice and Dalton Harris singled, but they were unable to score. That all changed in the bottom of the fourth. Griffen Bate led off with a double to right-center field, followed by a single to shallow left by Jaxson Miner. Bate came home on a sacrifice fly to right by Steven Laird, and Miner tied the game when he scored on a passed ball. Tooele loaded the bases again later in the inning after Payton Shields walked and Freeman and Jake Lopez were hit by pitches. After the Tigers made a pitching change, Harris drew another walk to bring Shields home with the go-ahead run. 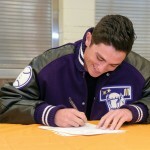 That would have been enough run support for Tooele pitcher Brett Porthan, who continued his strong season with a complete-game effort that included six strikeouts and no walks with just six hits allowed. Monday’s game actually increased his earned-run average to a still-anemic 1.96, with batters hitting just .187 against him in his four appearances. He has struck out 30 batters with three walks in 25 innings. However, the Buffs’ offense wasn’t done racking up the runs against Ogden’s relievers. Bate drew a leadoff walk in the bottom of the fifth and scored on Miner’s triple that one-hopped the center-field fence, making it 4-2. Another pitching change didn’t slow Tooele down, as Laird hit a line-drive RBI single down the third-base line and Shields doubled to deep left-center to plate another run. Shields later scored on a sacrifice fly by Lopez to make it 7-2. Porthan and Bate singled in the bottom of the sixth and scored on an Ogden throwing error on a ground ball by Laird. Shields added an RBI single to drive in Tooele’s final run. Shields finished 3-for-3 with two RBIs and two runs scored, and Miner was 2-for-3 with an RBI and two runs. Bate was also 2-for-3. Tooele’s winning streak, which has the Buffaloes tied with Juan Diego atop the Region 11 standings, has come at the expense of three struggling teams with a combined 3-25 record, including a 1-16 mark in region play. 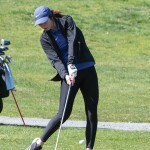 However, Tooele will get a chance to prove itself against stronger competition beginning Monday when it opens a three-game series against Park City on the road.